Dr. DAVID BLAKE is Professor of Pension Economics and Director of the Pensions Institute at Cass Business School, London, and Chairman of Square Mile Consultants, a training and research consultancy. He was formerly Director of the Securities Industry Programme at City University Business School, Research Fellow at both the London Business School and the London School of Economics and Professor of Financial Economics at Birkbeck College, University of London. He is consultant to many organisations, including Merrill Lynch, Deutsche Bank, Union Bank of Switzerland, Paribas Capital Markets, McKinsey & Co., the Office of Fair Trading, the Office for National Statistics, the Government Actuary’s Department, the National Audit Office, the Department for Work and Pensions, HM Treasury, the Bank of England, the Prime Minister’s Policy Directorate and the World Bank. In June 1996, he established the Pensions Institute, which undertakes high-quality research on all pension-related issues and publishes details of its research activities on the internet (http://www.pensions-institute.org). 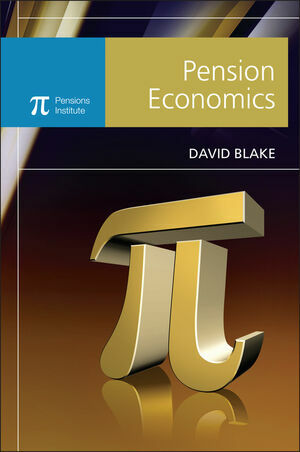 1.1 What is pension economics? 1.2 Types of pension scheme. 2 Individual Pension Decision Making. 2.3 Pensions and retirement decisions. 2.4 Empirical studies testing the validity of the lifecycle model. 2.5 The Feldstein lifecycle model with induced retirement. 3 Corporate Pension Decision Making. 3.1 The provision of pensions by corporations. 3.2 The role of pensions in employment contracts. 3.3 The nature of corporate pension liabilities. 3.4 Quitting and mandatory retirement. 3.5 Tax and pension fund policy. 3.6 Agency costs in pension schemes and pension funds. 4 Pensions in the Diamond–Samuelson Overlapping Generations Model with Certain Lifetimes. 4.1 The two-period Diamond–Samuelson OLG model. 4.2 Pensions in the Diamond–Samuelson OLG model with exogenous labour supply and retirement. 4.3 PAYG pensions in the Diamond–Samuelson OLG model with endogenous labour supply and retirement. 5 Pensions in the Blanchard–Yaari Overlapping Generations Model with Uncertain Lifetimes. 5.1 The Blanchard–Yaari OLG model with uncertain lifetimes. 5.2 PAYG pensions in the Blanchard–Yaari OLG model with endogenous labour supply and mandatory retirement. 6 The Economics of Ageing and Generational Accounting. 6.1 The macroeconomic effects of ageing: Declining population growth and the increasing dependency ratio. 6.2 Pensions in the Diamond–Samuelson OLG model with a variable population growth rate. 7 Risk Sharing and Redistribution in Pension Schemes. 7.1 Risks in private pension schemes. 7.2 Risk sharing in personal pension schemes. 7.3 Risk sharing in occupational pension schemes. 7.4 Redistribution in private pension schemes. 7.5 Private sector market failure and the compensating role of state pension schemes. 7.6 Risks in state pension schemes. 7.7 Risk sharing in state pension schemes. 7.8 Redistribution in state pension schemes. 7.9 The viability of PAYG state pension systems and the transition costs to funding.